Then you'll want to get this really cool chocolate-colored badge! If you like to add sources to profiles (and who doesn't love to do that? ), please consider joining us! After you read about the Sourcerers Challenge, you can join your fellow WikiTree'ers who are recording their successes during the May Sourcerers' Challenge. Thank you Star, you make a great Wikitree Cheerleader. I certainly don't look anything like this cheerleader, but I love the WikiTree pom-poms! Ha! I love the cheerleader, and Star is a most excellent one, as well. Thank you both! I like it! 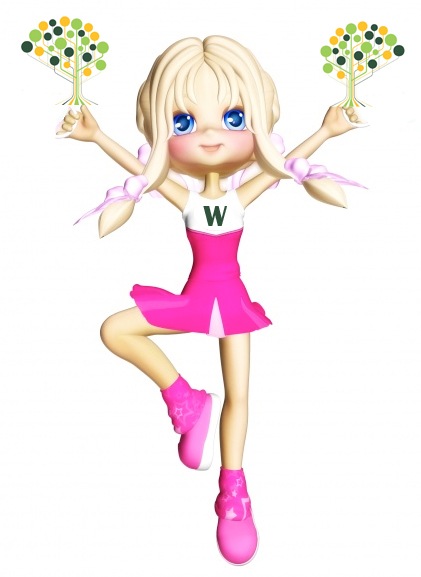 The Wikitree cheerleader. Also like chocolate. Well done, Star!! I've been Sourcering; I just haven't had time to document it all in G2G. Still -- the work is getting done, so yay!! I have been adding sources to Unsourced or limited source profiles for a long time now. May I have this badge please? I participated in the August Sourcerers challenge and am the 1st entry on page 3 with 30 profiles sourced. I am signed up for the Sept challenge as well. Go to the August Sourcerers Challenge page. Make a comment after your answer or after the original post and just ask if maybe someone forgot to give you the badge. This was a great way to catch the eye! Chocolate, Yummm! I know it worked for me, Sherry. I saw that chocolate badge and had to have it! And I am having a GREAT time doing it! Add me as a volunteer . I am a chocolate lover. That's great, Sherry. Just go to the April Challenge and begin. Join the others who have improved more than 9,000 profiles so far this year! Do you like to solve puzzles?